"Gentlemen, this game is five card stud poker. There's no limit. No string bets. You can check and raise. A dead man has one half-hour to raise his roll outside and get back in the game." Early in The Cincinnati Kid there's a scene where the title character (played by Steve McQueen) enters a pool hall to collect some money from a gambler. Walking across the room, he sends his greetings to a pool player named Eddie. I like to think this is a tribute to Robert Rossen's excellent pool drama, The Hustler. It would be entirely fitting if this is the case, for Norman Jewison's movie from Richard Jessup's novel is akin to Rossen's film in several ways. The Cincinnati Kid is a great poker player in 1930s New Orleans. Sitting in dingy rooms with low-level hoods, he avoids attack when his opponents become sour after being cleaned out. The Kid's reputation is growing, with rumors that he and his manager, Shooter (Karl Malden), will replace the established king of five-card stud, Lancey Howard (Edward G. Robinson). Howard's arrival in New Orleans prompts talk of a game between the two heavyweights, but it'll be difficult for the Kid to dethrone Howard. He humiliates a wealthy celebrity, Mr. Slade (Rip Torn), in a masterful display of card playing. Now Slade wants revenge and devises a plan to have the Kid win against Howard: he blackmails and bribes Shooter into dealing a crooked game. As tensions run high, with Shooter deliberating whether to cheat or not and the Kid wracked by nerves, the salacious Melba (Ann-Margret) threatens to force a wedge between the Kid and his lover, Christian (Tuesday Weld). As Shooter's wife, Melba is a dangerous woman always looking for the big score. She's picked the Kid as the next big thing and pursues him vigorously. The stage is set for the big showdown, with the young and vibrant Kid facing off against the old and stagnant Howard. What is so amazing about the script, penned by Ring Lardner Jr. and Terry Southern, is how it manages to keep the audience guessing what will happen next. Most people have seen enough stories about the young hot shot taking on the old big shot to know how the formula works, but The Cincinnati Kid doesn't follow those rules exactly. Some of what one expects to happen does, but there are many surprises and twists to the plot that you are not likely to see coming. Even knowing exactly what happens in the final card game, I found myself caught up in the tension of these men's lives thanks to the sure-handed direction of Jewison and the taut pacing by editor Hal Ashby. In no small part, the success of the film hinges on its ability capture the atmosphere of backroom gambling in Louisiana. Using muted colors and a quasi-documentary shooting style, Jewison and his crew give a rustic look to the film that reflects its story's period while also making it feel immediate to the viewer. The jazzy score (with the theme song being sung by Ray Charles) adds a dimension to the drama that a traditional orchestral score would lack. Even though MGM produced the picture, you would think you're watching an independent film because it plays against type and violates so many of the conventions of this kind of story. Furthering the success of the film is the cast of actors. Ann-Margret and Tuesday Weld represent two attractive options to the Kid and it is uncertain which one he will choose thanks to their astute performances. Ann-Margret is a real treat, sliding into the role of the bad girl with a hint of enjoyment and a strong sense of sexuality. Malden delivers stellar work as the wise, conflicted gambler who must choose between his own financial security and his ethics. Working with Malden, McQueen succeeds at being both the cool card player and the foolish gambler. However, the legendary Edward G. Robinson is the best of the bunch here. His skill at delivering lines with remarkable ease and sophistication makes him the perfect embodiment of the king of five-card stud. Even as Lancey Howard struggles to stay awake and function properly, Robinson's performance never lets us truly believe that he's down for the count. This is a great movie. It's not just for poker enthusiasts such as myself, but can be enjoyed by all who appreciate an intelligent script, good acting, and self-assured direction. Even 40 years after its original release, The Cincinnati Kid still deals one helluva hand. Image Transfer Review: The anamorphic 1.85:1 widescreen transfer is fittingly dirty—I suspect this is a result of Jewison's intention to make the film somewhat grimy. Print defects do emerge, but nothing distracting. Detail is strong, with nice depth helping to create a film-like look. Colors are muted as was the intention of the cinematography, so this is a fair representation of the original material. Audio Transfer Review: The original mono sound mix is included on this release and has been cleaned up. No hiss or other distortions to the audio are evident, with dialogue being audible and the musical score coming through nicely. A French mono track is also available. Extras Review: As part of Warner's Steve McQueen Collection, the supplemental material here is brief but interesting. Norman Jewison's feature-length commentary has some gaps of silence, but when he does speak it is very good indeed. He discusses his ideas behind certain shots and the importance of Hal Ashby to the film, but shares many anecdotes about taking the production from Sam Peckinpah and his struggles with the producers, including the ending. In addition to the Jewison commentary is a scene-specific commentary by Celebrity Poker Showdown hosts Dave Foley and Phil Gordon. Gordon is a professional poker player and talks about how the game has changed over the years, giving some interesting insights into the film's depiction of 1930s poker games. Foley, however, is a wasted addition as he makes lifeless jokes that only distract Gordon from commenting on the movie. A short vintage featurette, The Cincinnati Kid Plays According to Hoyle (06m:15s), is split in half between showing Joan Blondell learning how to deal cards and a clip from the film's climax. There's little information contained in the featurette, so it's kind of gratuitous. Finally, the original theatrical trailer is provided in anamorphic 1.85:1 widescreen. 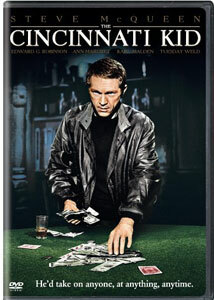 Finally available on DVD, The Cincinnati Kid comes to home theater enthusiasts with adequate extras and good transfers.